Everybody has a basic understanding and knowledge about their heart and that it beats with a dull 'thud-thud', and also that it is a basic function of human life but most people are unable to describe exactly what occurs during a simple heart beat. What Is A Heart Beat? When the blood in your body has been circulated it returns to the heart and into the right atrium. This chamber then pushes the blood down into the right ventricle where it is pushed through an artery to the lungs. This blood is then re-oxygenated and sent back to the heart and into the left atrium. From here it goes into the right left ventricle where it is distributed to the rest of the body.The movement of the blood through the heart is caused by muscular contractions which occur as a result of electrical activity. 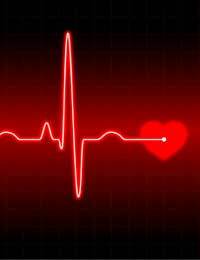 A normal adult heart beat will be a rate of around 60 - 80 beats per minute while at rest. The normal heart beat that contains a normal rhythm and regularity is called sinus rhythm, when the rhythm is not of a sinus rhythm, it is called an arrhythmia. Arrhythmias are very common and are often not serious or long term but in many cases an arrhythmia can be the sign of more serious problems and will need investigating and treating.It is very common and even healthy in some cases to experience fluctuations in your heart rhythm and episodes of increased activity or excitement may cause your heart rate to deviate slightly from the norm and this should be encouraged in order to exercise the muscle and keep it healthy. Almost everyone will experience a faster than normal heart rate everyday. This may be a result of increased physical activity, because of a surge in adrenaline or if they are stressed. This is normal and is not to be worried about.A heart that maintains a sinus rhythm but is faster that a resting heart beat is called tachycardic. If however your heart rate is abnormally fast and there is no evident cause and continues to race for long periods it is advised that you see your GP who will perform some tests and examine you to determine the cause.There may be a very reasonable explanation for a fast heart rate, but equally it may be a sign that there is something wrong, occasionally serious. The chances of suffering from a long term fast heart beat may be because of smoking, low fitness, being overweight, using drink or drugs or because of a physical problem that may be treatable. Occasionally a heart rate may drop to a lower and slower rate than normal. This is called bradycardia and may be a sign that something is wrong. When the human body is at rest or when we are asleep the heart rate slows as it is not required to work as hard as normal. It is also true that those who are physically fit are likely to have a slower than average heart rate as the muscle is in peak condition and again doesn't have to work as hard to maintain blood flow to the rest of the body.For those who feel their heart beat is slower than normal and are regularly feeling faint, it is advised that you see you GP who will perform some tests to determine the cause. The heart beat is a human necessity and often taken for granted by most of us as we do not fully understand or appreciate it's complex but essential functions.Without a heart beat the human body could not survive so it is important that we look after our heart in order for it to serve us well in life. my 1year old daugther,has a bad cold,first a runny noise,cough then flem now she heart rate is fast,what shud we do n why would it be that way? I got a question. Me and my older sister are born with a faster heart beat than normal. The way my boyfriend describes my heart beat is that it sounds like a cat heart beat. Was wondering what causes it.